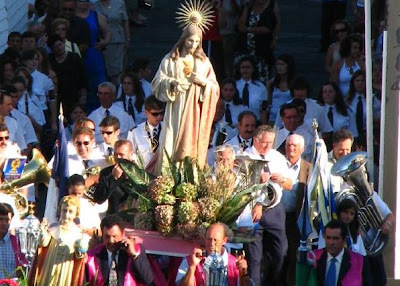 The enthusiasm and colour of Portuguese pilgrimages is renewed every year in the Festivals of Senhor Santo Cristo dos Milagres, held at the town of Santa Cruz da Graciosa, which is specially decorated for the occasion. The ceremonies attract people from all over Graciosa and from other islands as well as Azorean emigrants in North America. They are held every year in August. The Festivals of the Holy Ghost are a symbol of the devotion of the Azoreans and an expression of a cult with medieval roots. They enliven the villages on Sundays with the procession of the "emperor", the showy decoration of the chapel called "theatre" or "empire" and the "bodo" or banquet in which wine and food are distributed. The festivals are repeated all over the island after Whistsun and they join together local residents and outsiders in the same religious and festive spirit.